Gilmore Girls: Best episode is They Shoot Gilmores, Don’t They? It’s nearly summer, the perfect time to catch up with a few of those shows everyone is always saying you should watch. But there are so many! How can you decide which to try? You need to find the gateway episode, one you can watch without any background knowledge and which will give you a real sense of the show—and whether you’ll like it. The title of Gilmore Girls is a little misleading. Yes, the show centers around Lorelai Gilmore (Lauren Graham)—who left the home of her wealthy parents after getting pregnant at 16—and her daughter, Rory (Alexis Bledel), whom Lorelai raised on her own while working at an inn. But it’s not just about the mother-daughter duo. The strength of the series comes from its great ensemble cast—and the way they depict a whole host of middle-class American lives. Having moved to the small town of Stars Hollow, Lorelai tries to make something of herself as a single mom without her parents’ help—but then reluctantly asks them to finance Rory’s private-school education. The tension that ensues is a major part of the series, along with various other crises, both personal and professional. When I first began watching the show—which was created by Amy Sherman-Palladino, who went on to make Bunheads—I was a sophomore in high school, the same age as Rory in Season 1, and the character became a guide for me. I watched her support Lane Kim (Keiko Agena), a lifelong friend raised by a strict religious mother, by offering an outlet to vent along with smuggled junk food and music. I went through college applications and broken hearts with her. I found my career path because I was curious about her work as a journalist. Whether or not you’re a sophomore in high school, I’d recommend starting with episode 7 from Season 3, “They Shoot Gilmores, Don’t They?” It has a bit of nearly every essential aspect of the series. There’s an important scene showing Rory working on the school newspaper at that fancy private school; her friendship with domineering classmate Paris Geller (Liza Weil) comes into play; a Friday night dinner scene with Emily Gilmore (Kelly Bishop), Lorelai’s mother—who hosts the weekly meals in an effort to gain some influence with her daughter and granddaughter—gives you a feel for the show’s family dynamics. Many of the key characters from the quirky, vibrant town Lorelai and Rory live in play a part in the episode. Most importantly, the episode showcases, as most episodes of Gilmore Girls do, fast-talking wit, clever cultural references, and general fun-loving ridiculousness. At the center of the episode is a 24-hour dance marathon, a small, self-contained drama of its own. Lorelai battles Kirk (Sean Gunn), the town oddball, for a trophy and bragging rights, while Rory gets dragged into it because her mom has trouble recruiting another dance partner. The hint of romantic possibilities between Lorelai and Luke (Scott Patterson), owner of the town diner, adds some intrigue to a generally lighthearted episode. Meanwhile, Luke’s nephew Jess (Milo Ventimiglia) taunts Rory and her boyfriend, Dean (Jared Padelecki), until all three are at a breaking point. The writers sneak in just enough exposition for a newcomer to understand what is happening, and the various pop-culture references are accessible enough that any viewer can enjoy them. Amid the charm and quippy banter, the episode has a distinctly pro-woman vibe typical of the series—while not shying away from moments of girlish silliness. (The name of the series is only a little misleading.) At one point, Rory’s friend Lane calls and hangs up on her crush repeatedly; when Dean expresses confusion about why Lane doesn’t just talk to him, the girls and Lorelai chalk up such ignorant speculation to Dean being a boy. At the end of the episode—spoiler alert—Lorelai consoles a broken-hearted Rory at the end of the marathon. Kirk, who has just won, hoists his giant trophy above his head and does laps around the gym to the theme song from Rocky. 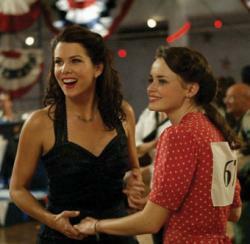 It’s a perfect Gilmore Girls moment, sad and hilarious and sweet.